Here I found some good news for my Galaxy SIII; where Apple launched its sixth version of iOS and Microsoft launched Windows 8 with many valuable improvements. So Google will have something for Android users. 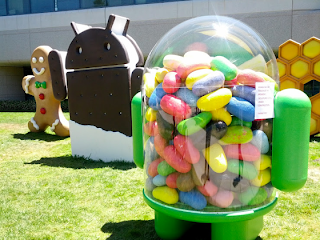 According to the information Google will officially introduce Android 4.1, codenamed Jelly Bean and the especially the 7-inch tablet of the Nexus. I am really excited and awaiting to upgrade my Samsung Galaxy SIII. The first information, many people believed that Google will launch Android version 5.0 with code-named Jelly Bean. But recently the things become apparent when the key information from Google revealed that, this was 4.1 only, of course the code-named is Jelly Bean. The upgrade version won’t significantly different from the current Android 4.0, the battery is more optimal, improved search bar and special Chrome browser will become the default browser. As usual, the Galaxy Nexus will be the first phone to receive this upgrade.